Groß, kräftig, kräftiger Kopf, sehr gut Pigmentiert, fester Rücken, mit gut gelagerter Kruppe, sehr gute Brustbildung und Gesamtwinkelungen, sehr gut raumgreifende Gänge. Wesen sicher, TSB ausgeprägt;läßt ab. where do you live? how much the price of mating with Tino? That's not true, because it is Tino came to Serbia from Germany, my good friend and well known breeder bought Tino from Germany and sell for a lot more money in Italy. Tino is currently in Sicily and the dog is healthy. If you look tino pedigree, you will see that none of his predecessors has no disease, I see no reason why someone invented the tino have dysplasia when it is not true, I saw a dog and I can assure you that this is not true. Now in Italy and will breed with the patient Tino! Attention dog has elbow DYSPLASIA! Veterinarian in Bulgaria make this diagnosis after which the dog was sold in Serbia, then already in Italy. Congratulations to all owners of sick puppies from Tino! On this page the first owner of Tino recognize the problem and elbow dysplasia Tino. You can translate from Bulgarian language translation program. Tino Junior v. Biso, а и всчки онези кучета, които е произвел !!! TINO E UNIKALEN EGZEMPLIAR I E NAI PERESPEKTIVNOTO KUCH V BALGARIA. This dog has elbow dysplasia! Be careful when you offer his puppies. The dog has no IPO, no Kyorung and never allowed to breeding BOGOK member of BRFC a member of the FCI and SV. The photograph of this dog "today" makes his hindquarters look ridiculous. Честито на всички собственици на кученца от БОЛНИЯТ Тимо ! Кучето има ЛАКЕТНА ДИСПЛАЗИЯ която за не знаещите се предава генетично на поколението на болното куче. Да са ви честити болните кученца от болният тино ! Който не е запознат с коварната болест ДИСПЛАЗИЯ нека потърси в гугъл ! Very beautiful male . Vhere is TINO ? Would anyone be able to tell me how to get in contact with the owner of TINO ? Kontakt : ? This dog has dysplasia, according to X-ray images in Bulgaria! Tino bring very nice puppies. Very nice male with top bloodlines. Tino is a very beautiful dog with an excellent temperament! He is a better dog but picture is not that good i like to see the better pic "OWNER". 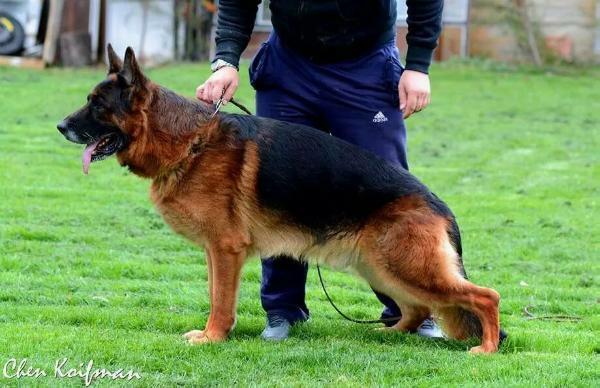 Absolutely stunning male with a great pedigree. All the best ahead! What a dog and what a combinaton of two distinct bloodlines. Could not get better then this. this dog look very promising and i am sure he will achieve good places if shown int he BSZS.